2012 CLA Game Fair at Belvoir will see the launch of the first ever casting competition which will allow anglers with different disabilities to compete alongside able bodied anglers. This, we believe, is the first competition of its kind and will be launched at the CLA Game Fair to be held during the weekend 20-22 July. The aim of the competition is to demonstrate that having a disability does not have to restrict taking part in fly fishing. Disabled anglers will compete on equal terms with their able-bodied counterparts during the event. The competition is designed to test the skills needed to fly fish successfully from a boat and is open to all anglers whether you have a disability or not. All competitors will compete sitting down in a wheelchair-friendly Wheelyboat and points are scored for speed and accuracy with a fly rod rather than distance. £100 to the respective disabled and able bodied anglers achieving highest scores on each of the three days of the CLA, in the event of a tie the prize fund will be split equally among the anglers tied for first place. An overall first prize of £400 to the highest scoring angler, in the event of a tie the prize fund will be split equally among the anglers tied for first place. Iain Wood FishPal Managing Director says: “FishPal are proud to be sponsoring the first ever disabled casting competition at the CLA Game Fair during this 2012 Olympic year, let’s not forget this is also the year of the Paralympic Games. This competition creates opportunities for all anglers with any disabilities to participate in the sport of angling”. The Salmon and Trout Association are responsible for setting up and running the competition. Their generosity clearly shows what can be achieved by the industry working together and the whole event should prove to be a huge success for all those involved. Wheelyboat Trust’s vision is straightforward – open access for disabled people on waters everywhere through a range of Wheelyboat models to meet everybody’s needs. In the year of the London 2012 Olympics and Paralympics, the Wheelyboat Trust, Salmon & Trout Association and FishPal are aiming to demonstrate inclusivity for all anglers. 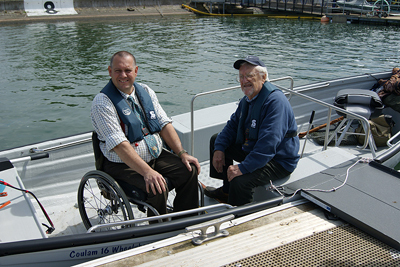 FishPal has supported the work of the Wheelyboat Trust through charity donations made through bookings on http://www.FishPal.com.